RAVEN'S RELICS - WHERE AUTHENTICITY IS A PRIORITY!!! I AM ACTIVELY LOOKING FOR COLLECTIONS OR SINGLE PIECES! IF YOU WANT TO GET THE MOST OUT OF YOUR COLLECTION, OR SINGLE PIECES, THIS IS WHERE TO GO! I OFFER A VERY FAIR 70 - 80% OF YOUR ARTIFACT VALUES! Hello fellow collectors, My name is Paul Frey, and I have been involved with the Indian artifact hobby for over 50 years! I handle mostly Pa. and north east artifacts, but will offer anything that's authentic and of interest. I have a very liberal 15 day any reason return, with a GUARANTEE of AUTHENTICITY. ( More time can be given if you feel the need to send an artifact out for a COA ) Every artifact I sell is first examined for correct typological criteria, then microscopically examined for patination and weathering details. In my opinion, I believe the two first priorities an artifact must have, are authenticity, and verifiable provenance. Click on the photos to enlarge them. 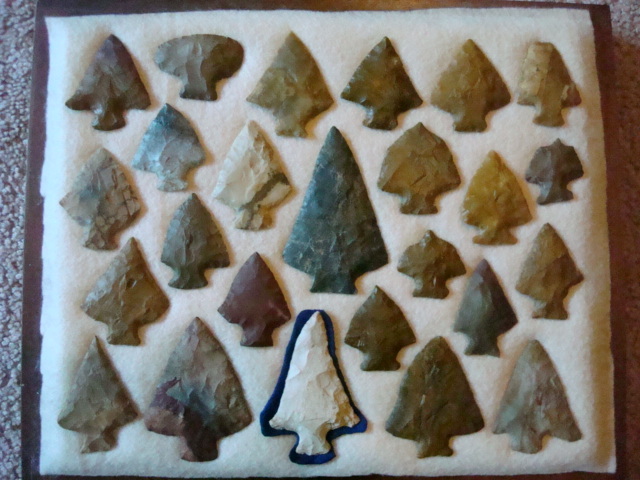 EXCLUSION: I do my best to describe each artifact as best as I can, noting field dings, breaks, glue residue, etc., however, I may miss one or two in larger lots. I do guarantee the authenticity however. In most cases, if you feel the need to return only one or two artifacts from a lot, I prefer to have the entire lot returned for a complete refund, rather than just a few pieces. On large field grade lots, it's easy to miss a few dings, but this can normally be seen in the photos. Please look at the photos carefully, and ask any questions prior to buying if your not sure, or you need a better description. 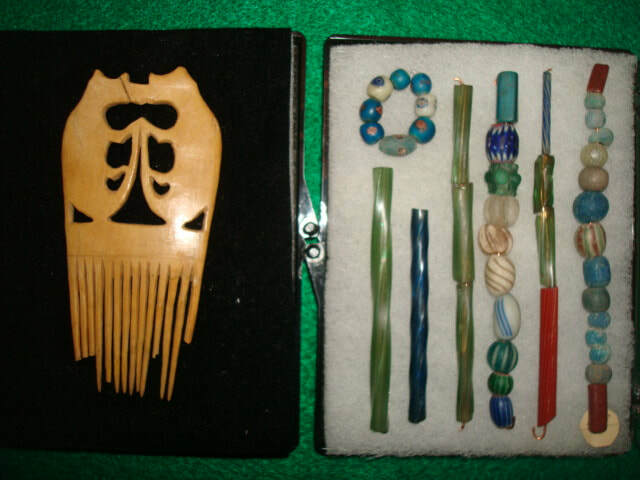 I also offer consignment sales of your artifacts, entire collections, or single pieces. 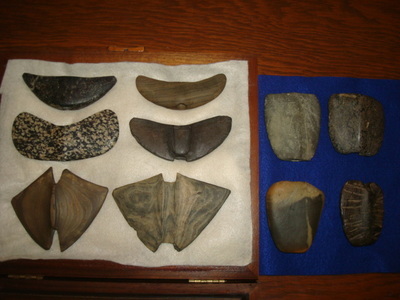 I offer collection appraisals and authentication of Pa. and north east artifacts. Email me for information, or any questions and concerns. And the only fair way to sell artifacts, is first come-first serve. If two people want the same piece, the first email or contact get's it. ​ I accept paypal, checks, M.O., cash, BUT, please note that I do not have checkout from the store. PLEASE EMAIL ME FOR INFORMATION ON ANY ARTIFACT YOUR INTERESTED IN, AND PAYMENT INFORMATION. PKFREY@HOTMAIL.COM. I consider REASONABLE offers on anything your interested in ! Thanks for looking!! ​PLEASE NOTE: Unless prior arrangements are made, if payment isn't received within 7 days, I reserve the right to relist and sell any artifact. I leave the shipping up to the buyer. Shipping rates are always increasing. I normally use First Class. Depending on weight, most items can be shipped First Class with a Tracking Number for between $3.50 - $5.00. If the buyer wants Priority, I use small flat rate at $7.25. Please keep in mind, if you like the artifact from a photo, you will LOVE it when you hold it! The artifacts are ALWAYS much better in person vs. a photograph. And I am not the best photographer in the world. 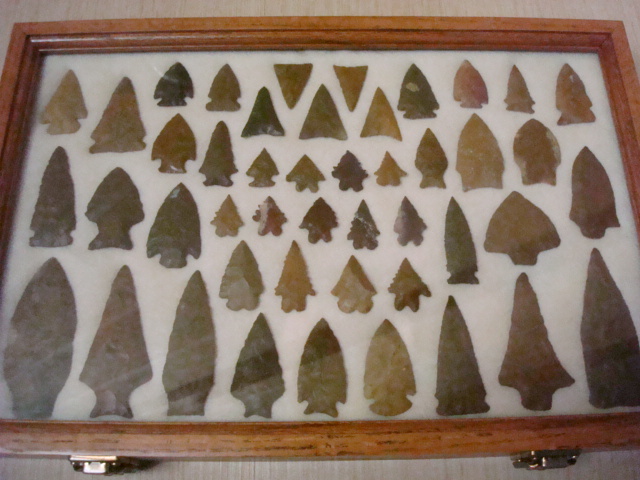 GALLERY VIEW OF PENNSYLVANIA ARTIFACTS. 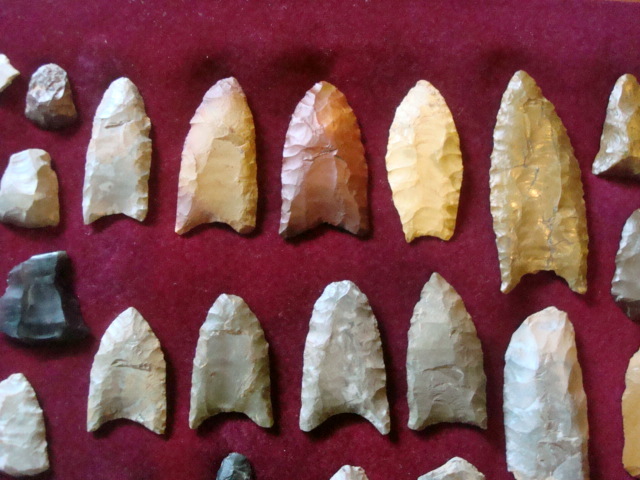 Pa. isn't known to have a large quantity of pristine artifacts, mostly because we have a limited resource of the better cherts and flints. Jasper is the best, and most sought after, lithic material from Pa., and the occasional Flintridge or Ohio cherts that travelled into Pa. However, in years past, quality artifacts have been found when artifact hunting was in it's prime. This period was mostly in the early 1900s. Quality artifacts are hidden away in collections that are still in storage, and occasionally become available to the collector. Pa. was the home to prehistoric Native Americans from the Paleo Indian period ( ca. 12,000 BC ), to the Historic Period ( ca. 1770 ). 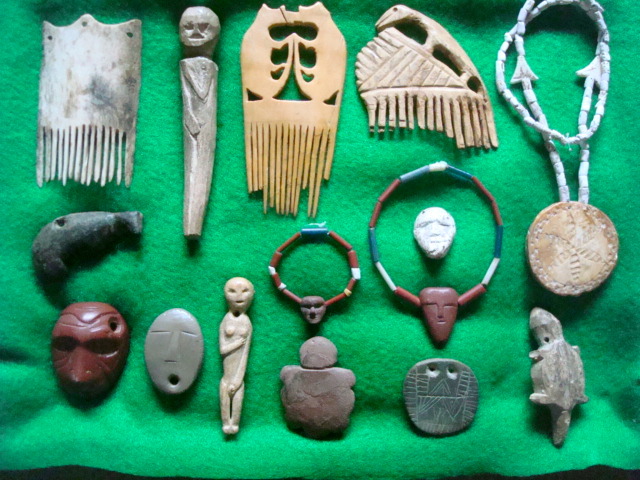 Here are a few artifacts from my collection, and most of these were found prior to 1950, with the exception of my personal finds between 1962-1990. Represented are a selection of pottery vessels, jasper points, Perkiomen points, spears/knives, bannerstones, a complete soapstone vessel ( Md. ), gouges, Clovis points, and pipes. 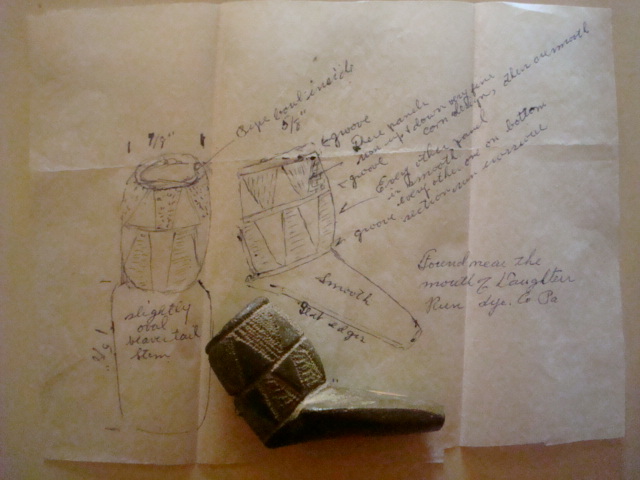 The photo of the single pipe is called the " John Koch pipe", with his original drawing when he found it. And a photo of one the nicest maskettes ever found. It's Clinton Co. pipestone with three fish incised on the back, and tallied around the entire edge. From Great Island, Clinton Co., Pa. 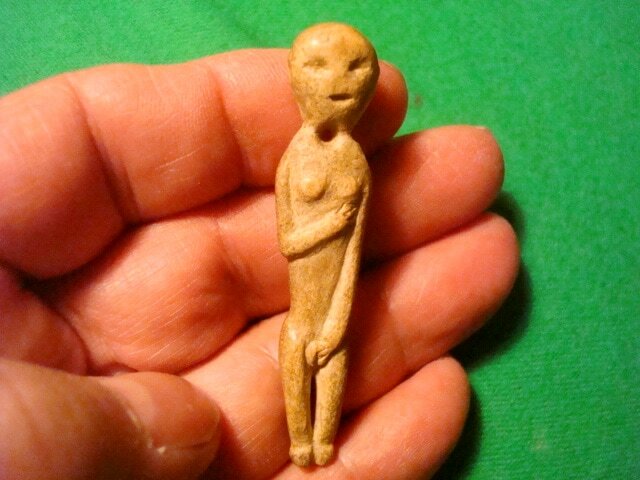 The antler figurine is known as a " Sept. Morn Figure ", and is one of the finest ever recovered from N.Y. And a frame of Susquehannock trade beads and items from mostly Pa., and N.Y. That's my daughter, Marie. 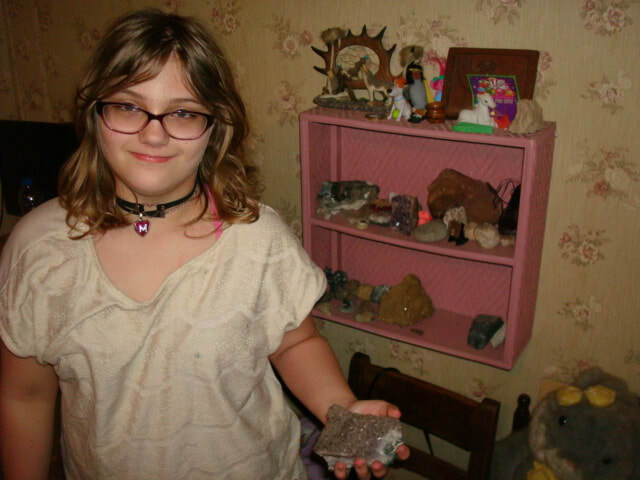 She has her own little " Indian Rocks " shelf in her room! My other daughter, Amanda, isn't a big rock collector. I'm sorry, but the gallery artifacts are for viewing, but will be for sale in the future. I'm not quite old enough to quit collecting, but soon!!! ARTIFACTS BELOW FOR SALE. CLICK ON THE PHOTO TO ENLARGE THEM. This is an extra long strand at approx. 43". Large disc shell beads, Mississippian, ca. 1150 - 1400 A.D. Reported as Montgomery Co., N.C., but I don't have site specifics. These type beads are often found in mounds, but the records have been lost on the provenance. But I can guarantee authenticity! The last photo is a truer color. These are oxidized to a tan/light cream & reddish color, and highly polished. I counted approx. 405 beads. Less than $ .80 cents per bead!!! I have a large lot of purple and white shell wampum, all excavated in 1937 by Harry Schoff at one site. From the Boughton Hill Site, Ontario Co., N.Y. This was the large Seneca Indian village known as Ganondagan, 1650 - 1687. These were acquired by Mr. Newton Farwell from Mr. Schoff prior to 1960. There's actually more purple than white, and you will receive a nice mix of both colors. The purple are from the Quahog shell, the white are from the Whelk shell. The photo of the entire lot is wet to enhance and show the different colors. When these dry, they fade back to mostly a more whitish color. I looked these over, and the majority have been cleaned and the holes are open for stringing. ( You won't receive the ones in the photos, they just represent what you will receive. ) But you will receive the number you order from the large lot, and they will all be in better to excellent condition. No broken ones or cracked. I don't know of any other GUARANTEED AUTHENTIC wampum for sale anywhere, except a few on ebay. As far as pricing, these have been consistently selling on ebay in small lots for $7 - $9 per bead!!! So if that's the market value, then here you will pay less! You can buy less than 25 if requested, but I have to make it a minimum of 10 beads, with 10 bead increments. 50 beads on ebay would cost you between $350 - $450 !! Here, the same amount would be $250 !! Why shop ebay!? This includes a flat grinding tablet ( 5" x 7" ), 9 field grade points, paint pot full of ochre, container with pieces of ochre ( all Indian River, Oneida Co., NY ), and a contemporary Cherokee soapstone pipe ( 1930s ). This was acquired by my consignor from another collector, and reported as Broome Co., N.Y., where the Chenango & Susquehanna River meet. There is a large tract of land there that contains multiple historic sites. This piece is no doubt odd, but unique, and I scoped it thoroughly, and it's 100% authentic, and I would think to the end of the 17th, or early 18th. century. The facial features are not Indian as seen in most maskettes. This part of Broome Co. was inhabited by the Onondaga and Oneida Indians, with a lot of trade going on. This piece actually is a complete piece, and at one time had a sharpened edge. ( Broken areas of edge marked in blue in the drawing.) It's not broken from a vessel or pipe. It's 2 3/8" H. The soapstone contains mica, quartz, and feldspar, consistent with northeast soapstone. The features are no doubt European, with broad nose, and large detailed eyes, and there are two educated guesses I can offer. This was made by an European and given, or traded, to an Indian as a token of friendship. 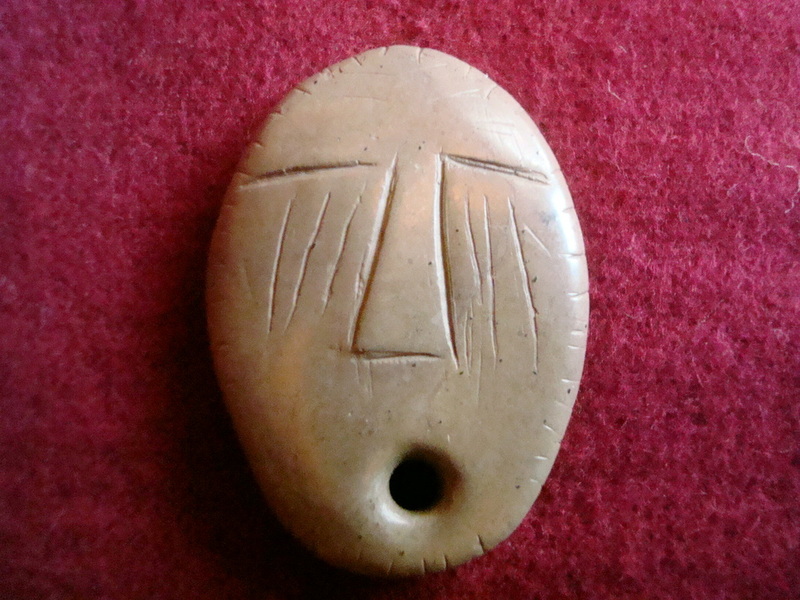 Or, an Onon./Oneida Indian carved it himself , in the image of an European that was trading at a village site. The Senecas at Boughton Hill did this often in the form of combs. They copied what they saw Europeans had, like horses, guns, hunting scenes, etc. A unique maskette similar to this was found by the 1918 Susquehanna Expedition by W. Moorehead, and pictured in his book, and that piece still remains a mystery. I can GUARANTEE IT'S AUTHENTICITY and vintage, but not who actually carved it. But I think it was grooved and large enough to wear as an amulet and a token of friendship between the Indian and the white man. Here's a fine, quality, Jicarilla Apache war club, in excellent condition. This would date to ca. 1875. From Dulce Lake, N. Mex. Bound with a one piece tanned horsehide wrap with a horsetail hair drop. The club is 19 1/2", overall length is 36". Completely sinew sewn, with a small stone encased in the leather head. These are sometimes referred to as " slungshot or flop head " clubs, due to the method of attaching the ball head. One small beaded area of tiny seed beads. A more recent piece of leather was added at the drop where it attaches to the handle, this was just for preserving the horsehair drop from being frayed and coming off. I did a lot of research, and reached out to very good friend who owns an artifact gallery in Santa Fe, and this piece has been established to be from the collection of A.H. Gottschall, Harrisburg, Pa.- ( 1854 - 1938 ). Mr Gottschall amassed a huge collection of early, vintage Plains Indian, and western Native American weapons and artifacts. Much of Mr. Gottschall's collection was acquired by the Penn Museum of Anthropology in Phila., Pa. With the exception of a few artifacts that were acquired by private collectors. His cataloged inventory of artifacts was published in a three volume set. The paper work is a copy of the cover of his catalog, with one page representing the manner in which his artifacts were cataloged. His entire three volume set was sold at auction for $700.00! ​Fine, rare, and quality example of an early Apache club with Mr. Gottschall's original tag. ​$ 550.00 REASONABLE offers considered! You have to be careful with these " Catawba " pipes. Many are just the Indian head with head dress, and these are molded tourist type items from the Carolinas. But there are original Catawba pipes that go as far back as the 1400s. From the Carolinas to south east U.S. This one is stone carved, soapstone, with a stem and a maskette like face carved into the bowl, with lines depicting hair style or head dress. Late 18th, or early 19th century. It's really a neat little pipe. Ex. R. Jenkins, N. Farwell. This is a very large bone awl at 7 1/4" . At first I didn't think the break was all the way through, but after a much closer look, it is. It's just been reglued so tight, the break is hardly visible. Old eyes, I guess!! So I marked it down, and for the length, it's still well worth my price!! It's still all there. Cat. # 710, and just says Lamoka. I would think that would be Kipps Island, or the main Lamoka Site, Schuyler Co., NY. But not stated in the catalog. An exceptional awl with nice use polish! A nice Coastal Plains chert Savannah River blade, 4 3/8" . Translucent, the one shoulder isn't broken, it was flaked that way. Here's some nice smaller midwest gem points, Lrgst. 2 7/8". A nice Merkle point, drill, obsidian, jasper, KRF. This is a piece we thought was a squared abrading stone. It's not! It's better than that!! It's a handled shaft polisher. The two grooves were the functional part, and these were used to polish and smooth wooden shafts. The black areas are polished mica particles. Rare piece! Hard mica schist material, 3" x 2 1/2". Southeast area, probably Early Woodland in age. A nice thin triangle form knife, either in the Cobbs variety, or Ft. Ancient. Marked Tenn. Very nicely flaked and thin. Tan chert similar to Ft. Payne, but duller in luster. Much nicer in hand, the nice flaking is hard to see with the color. 3 3/4"
​Here's a nice, early catlinite pipe with a catlinite stem. The bowl has a piece of early silk tied to it, why, don't know. But it meant something to the pipe owner! A vertical, flaring bowl with a squared mouth piece. The stem has a squared midsection and is complete. There's a wooded mouthpiece, but the piece for attachment to the bowl was in the stem but not drilled. Overall length is 19". 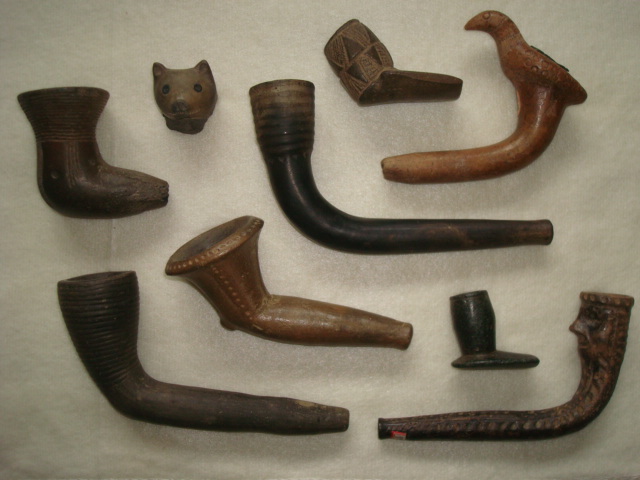 From the Homer Oatman coll., and based on his collecting years, this pipe would be ca. 1890 - 1910, Plains Indian. The Oatman coll. was acquired by William Arthur Moore, who passed away in 1929. Back then they cataloged this pipe as " #14 - Red Sandstone Pipe ." Nice early example of a Plains Indian pipe, probably from the Dakotas. 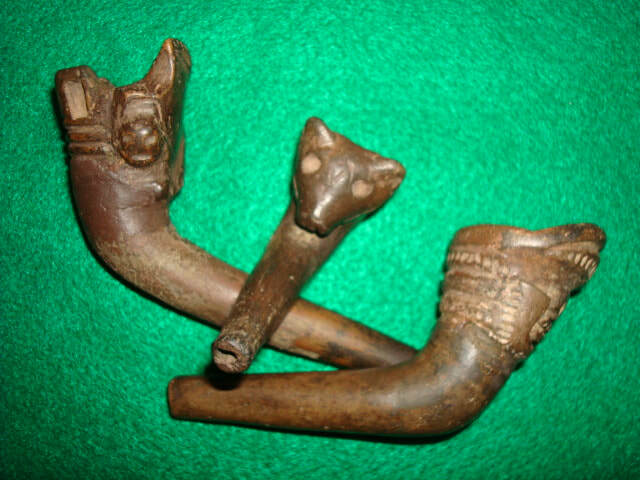 Some catalog entries are artifacts Mr. Moore purchased from collectors before 1910, so this pipe is at least pre - 1910. The stem is also to the same period, but it might not be the stem that goes with the bowl. But priced very fairly for what these are! $500.00 - Or Reasonable offer considered. This is kind of neat. A hand held, handled club or hammer. 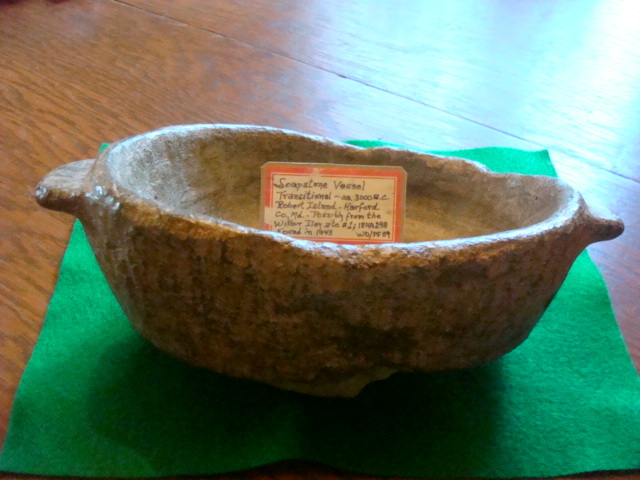 Not a pestle, and not hafted. used as is to club anything that needed clubing!! Maybe used to drive wooden stakes in the ground. 10 3/8", Traprock. Onondaga Co., NY. ex. Homer Oatman, William Moore. This is the characteristic type 3/4 groove axe, Jefferson Co., NY. A few ancient use dings, but a nice axe example. 6 1/4" x 4" wide. I think some of these pieces were stored in a garage or work shop. Some have red paint residue, very faint. Probably stored in a box near cans of paint . IDK. This is a light colored basalt pestle with tapered ends. 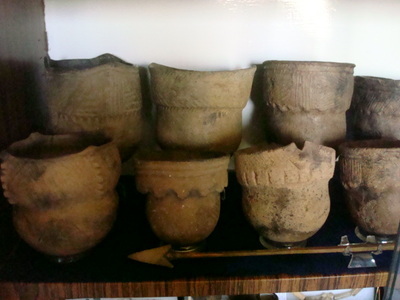 Typical of the south west Anazazi/Hohokam cultures. 900 - 1200 A.D. 14 3/4". This has a couple small spots where red paint was accidentally splashed on the piece. Comes with a round pitted hammerstone. This is a rare mini, silver Gorget, or Pendant. I believe it was cut from a sheet of very thin silver. It has hand engraved feather designs on one edge. Original silver attachment rings. 3 1/8". Very rare, just in the fact it's authentic vs. all the fake silver in the market! This is Ottawa, 1741 - 1790s. Found by the well known collector, Robert Bennett, L'Arbor Croche, Emmet Co., Michigan. Pictured on page 55, in the book, A Pictorial History of Fur Trade Goods in the Mackinac Straights Area. Very nice example and RARE artifact!! This is a 25" strand of various beads from the Great Tellico Site ( Talikwa ) Monroe Co., Tn. 40MR12. Late 1600s. Included are blue/white glass barrels, wire wounds, and shell. Ex. Tony Bautis. This area has been fenced in and is off limits to any further collecting. Authentic beads like these are getting harder and harder to acquire. A nice strand of small black tube beads, 20", from the Talladega Border Town, Muskogee ( 1770s ), Talladega Co., Ala. I don't believe this site is open to collecting in the future. SOLD GR 16 - Nice strand of glass beads! This is a 26" strand of trade beads from the Savannah Farm Site, Great Hiwassee or Old Town, Polk Co., Tn. Red and blue round larger seed beads, Early 1700s to late 1750s. The site is now destroyed preventing any further collecting. These were found in the 1960s. This is a very nice strand of colorful beads!! This is an exceptional bone awl, large at 6 1/2". Splintered on the handle end with use polish, and a nice polished tip. Cayuga, 1575 - 1600. Genoa, cayuga Co., NY. ( Hogs back/Travers Sites ). Excellent bone tool example!! These are white glass beads made to imitate shell. Large strand at 26". Savannah Farm Site, Great Hiwassee or Old Town, Polk Co., Tn. Early 1700s - late 1750s. This town suffered a small pox epodemic from 1738-1739 and was abandoned. The site is now destroted preventing any further collecting. 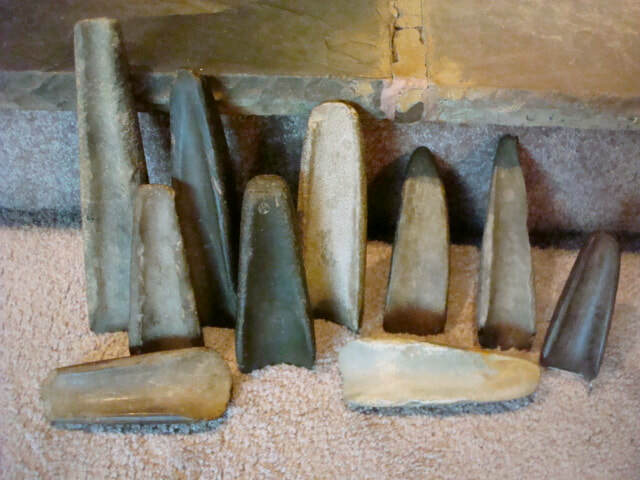 These are occassionally found on Cayuga Sites in NY, dating between 1758 - 1779. They must of had wide spread use. Nice strand of unusual glass beads! These are tough to type. There's a variety of types these would fit. Midwest, Tn/Ky, Ohio. The first one I think is a Boone chert Pontchartrain, then maybe a Benton, and a Hopewell, and an Adena ovate knife. Mozarkite, Boone chert, and Hornstone. But they have size and are nice points. The one has a small edge nick. Lrgst. is 4 1/2"
This is a unique piece. Correct drilling, lots of patina, with frost cracked quartz inclusions full of mineral deposits. Very thin, 5 3/8". It's either a notched, and drilled, tie on bannerstone, or a unique form of eccentric pendant. Almost a porphyry material. It's slate with quartz and mica inclusions. It was only marked Ill.
​This is a nice, fully drilled, banded slate crescent bannerstone. One end has been broken, but it's still a nice example of a rarer form. 3 3/4". Ohio, with a catalog number, B-63. Not perfect,( Like Ebay! ), but ya have to watch out for those perfect ones, sometimes they were never in a field!!! Small strand of Seneca trade beads, approx. 11", of black, blue, and white seed beads marked from the White Springs Site, Geneva, N.Y. ca. 1730 - 1770. Comes with a chert triangle point. NOTE: I think who ever found these may have thought they were on the White Springs Site, but that site dates earlier, 1685 to 1710. I think the beads are from Kashong, a village site only 7 miles away, but would date to the given dates on the card. This is an early Plains Indian club with a catlinite grooved head, and fully decorated with bands of quillwork. It's rare to find quillwork and not beads on these. It's early, 1840s, and there is condition issues, but it's still in decent condition for it's age, and the fact it was used. Rawhide wrapped handle with sinew stitching. 27" total length, with about 8" of missing quillwork on the stem. The wrap at the head has torn, and there hasn't been any repair work done. The catlinite head is 4". If perfect, this would be fairly valuable, but the price is in consideration of the condition. Here's a nice Plains Indian catlinite T bowl, contemporary, 1940s. 5 3/4". Very nice with the ash stem that some one made to go with this. Very nice display piece if you can't afford couple thousand for a complete original one! Over all length 29 1/2". Some one did an excellent job on the stem, and it's completely drilled. This is an exceptional celt like piece. By celt like, I mean it's made to resemble a celt, but the bit is completely rounded, not sharpened. And the poll end shows ancient battering. I think this was used more in the fashion of a wedge to split wood. It's Diorite, 7 1/2", and completely, highly polished. No damage, and an excellent piece! Ex. Sam Gundy, Ephrata, Lancaster Co., Pa.